Hair loss is a natural part of aging, but it can be accelerated by certain things. The average person typically sheds around 100 hairs per day. Although the body naturally regenerates these hairs, it becomes harder to do so as age increases. Every strand of hair rests in a cavity in the skin called a follicle. Hair loss occurs when hair follicles shrink over time, causing thinner, shorter hair. 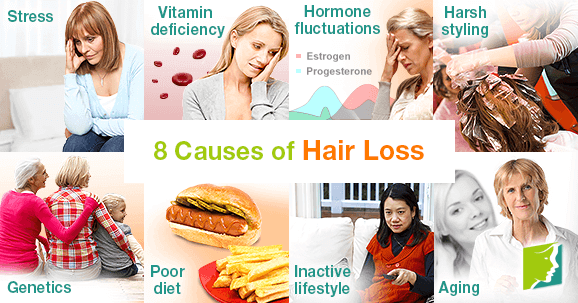 There are numerous causes of hair loss, including lifestyle factors like stress and poor diet. Keep reading to learn more about the common causes of hair loss. Stress is a primary cause of hair loss in both men and women. According to some studies, when you have a really stressful event, it can shock the hair cycle, pushing more hair into the shedding phase. Changes in estrogen and testosterone levels can cause hair loss. Testosterone causes hair follicles to shrink, so when estrogen levels drop during menopause, testosterone and androgen levels can spike, resulting in hair loss. As previously mentioned, hair follicles shrink over time. Consequently, after natural shedding occurs, there is little to no regrowth to replace the lost hair. Having a family history of premature balding increases the risk of experiencing hair loss at an early age. Hair loss related to genetics is known as androgenetic alopecia and according to The American Academy of Dermatology, it is the most common cause of hair loss. The gene can be inherited from either your mother's or father's side of the family, though you're more likely to have it if both of your parents had hair loss. What you eat is of vital importance to how you look and feel. Eating fried, salty foods high in saturated fats is commonly linked to hair loss, acne, and obesity. Living a sedentary lifestyle is a common cause of hair loss, as well as excessive stress and even depression. Frequent use of hot tools, harsh chemical treatments, and dyeing can accelerate hair loss. Heat and chemicals weaken the hair, causing it to break and fall out. Hair loss is, unfortunately, a natural part of aging. It affects both men and women, and can occur as early as your 20s. It is important to be aware of the common causes of hair loss so that you can avoid them. Helpful prevention methods include exercising regularly, reducing stress, and eating healthy. These treatment methods are inexpensive, easy to do at home, and offer other benefits like increased energy and improved mood. Click on the following link to read find alternative treatments for hair loss. Some hair loss and thinning is a natural part of the aging process for both men and women. Click here to learn how hair loss happens.